well book 8 should be back from press in 2 weeks. I will have it for SDCC. Looking forward to that show and in the next week I will have my big post with everything about it. I also had to reprint issue 2. Can’t believe how well they are moving. I am also excited for my travel schedule to slow down after comic con for 2 months – i am going to enjoy the break . My initial glance of Mama's house is that its split in two, with a smoking creator. Which my brain only resolves to a tree after seeing how unconcerned Mama and six of her daughters are. 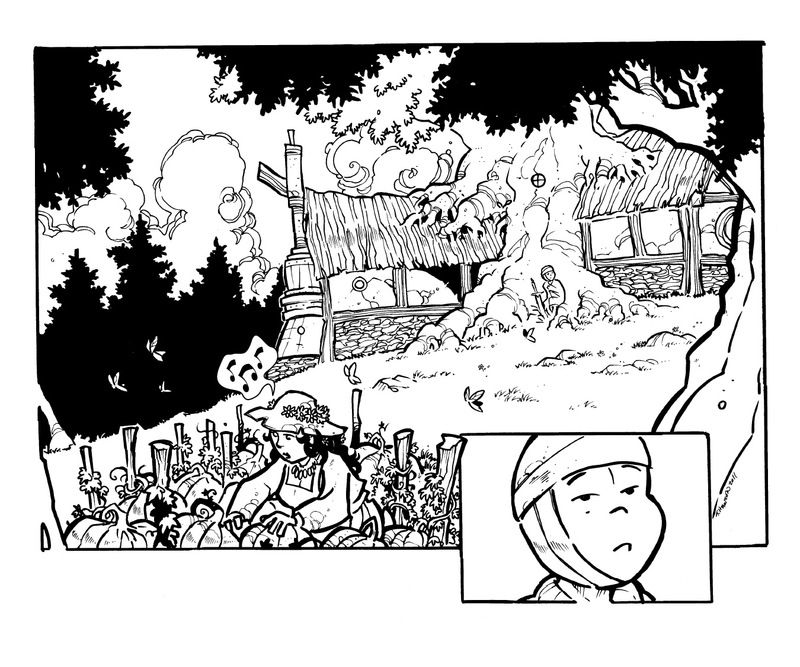 I love your lines, you really make inking into such a stylistic art. My guess, Bean can sense the coming storm (not the weather) though the sword. Momma's domain is essentially Underhill and the goblins will probably not tread there, I'd be surprised if Momma and Poppa don't know what is is going on outside. I certainly hope Bean isn't becoming complacent with his present situation. Though I think it would be quite easy, it is such an exquisite setting. Oooo!! New page OUTSIDE of print! !